The tragic loss of beauty in liturgy we should not dismiss lightly, for if there is one thing we can glean from Scripture, and from the Church’s two millennia of Tradition, it is that we should offer the very best to God in our worship of Him; yet what we often experience, sadly, is tawdriness and mediocrity, a second-hand sacrifice like Cain of old. Yet some might argue, and have so argued: who is to determine what is beautiful? Is beauty not in the eye of the beholder, and does not even the great Saint Thomas define the beautiful as quod visum placet, ‘that which pleases upon being perceived’? Should we not all just worship God as we see fit, according to our own aesthetic sensibilities? Is not a guitar strumming a few minor falls and major lifts as beautiful in its own way as Palestrina’s Missa Papae Marcelli, or as the ancient plaintive Gregorian chants echoing off the stone chapel of a monastery? Is not one man’s beauty another man’s banality, and vice versa? There is some small, and I emphasize small, grain of truth in this. We may all have experienced a kind of beauty singing ’round a campfire with a guitar of a summer evening, or a piano and hearth of a winter one. I have been there, joining in more times than I care to recall, and there is a joy and delight in such festivity and company. Yet the question we must ask: Is it the right kind of beauty for liturgy? For, and here is the rub, beauty is not a univocal reality, but rather an analogous one. Prescinding from the schmaltzy interpretation of the phrase, everything that exists is indeed beautiful in its own way, with some share in the true and perfect beauty of God, Himself, Who alone is beautiful without reserve. Hence, some things are objectively more beautiful than others, insofar as they approach the transcendent and eternal beauty of the Creator of all things beautiful. First, there is proportionality, which means all of its parts must fit together, and be of an equitable size, shape and configuration so as to please. Second, there is integrity, that the being must lack none of its essential parts. Third, and most foundational, there is clarity, that the being must signify and shine forth what it really is, in accord with its form or species. A knife is not a beautiful hammer, a mountain and a meadow each have their respective majesty and charm, and a man will never be a beautiful woman (Bruce Jenner, take note). When we apply these criteria to Liturgy, we may conclude with liturgical scholars such as Josef Ratzinger, Uwe Lang and others, that the beauty of liturgy consists in expressing what stands behind the veil of the sacramental signification, the eternal realities towards which we strive, or what we might term transcendence and liminality (from limina, ‘threshold’). That is, Liturgy should lift us in mind and heart beyond this world, to that heavenly realm which is yet to arrive in its fullness at the end of time, for which we must prepare, but in some way is already here, inchoately. Most of our lives are immersed in the secular and temporal, the ‘form of this world’ which is passing away, and we must through Liturgy, and most of all the Holy Mass, keep our “minds fixed on things above”. Liturgy that is secular and this-worldly, even if ‘beautiful’ and pleasing in its own more limited way, will only obscure what liturgy really is: Should the music at Mass remind one of a modern pop band, swaying nubile (and beautiful) young people with guitars and drums, belting out emotional heart-felt ballads, with amplifiers turned up to ten and beyond? Should priests (whether handsome or not) tell jokes, or anecdotes, catching the eyes of his congregants, all too aware of his own presence? Should the vestments not be splendorous, and the vessels of gold and silver, rather than cheap cloth and plain wood? Should churches resemble glorified ski lodges or flying saucers, or rather the mediaeval cathedrals, with vaults quite literally stretching to the heavens? I need not belabour the point, for it is only by grasping what Liturgy is, in its essence, that we can see the beauty proper to it. Left to our own devices, we would still disagree amongst ourselves, so the Church by her Magisterium guides us in how Christ would have us worship. So let us turn briefly to Sacrosanctum Concilium, the Constitution on the liturgy from Second Vatican Council, promulgated in 1963, just as the Novus Ordo was being implemented in its editio typica Latin version. We will focus on the beauty of music, which is the most essential and integral aspect of liturgy, besides the actual sacramental words and actions of the priest making the Eucharist present ex opere operato. Sadly, music is also the aspect now most neglected. I once heard a musician at the beginning of a Mass, with his guitar strung around his shoulders, announcing to us congregants that ‘it’s not liturgical music unless everyone can sing it’, a principle that would obviate just about all of the ‘musical tradition’ of the Church, most of which is not meant to be sung by the people, but rather by those with the training and talent to do so. The people rather enter into the music, by what the document calls particpatio actuosa. Unfortunately, this term is usually translated as ‘active participation’, which evokes images of the congregation belting out hymns Lutheran-style, and all singing at least something. I cannot be the only one hard-pressed to find moments of silence in modern liturgy. But this phrase, not easy to render into English, means something more like actualized participation, in the sense of an intense form of prayer and devotion, what Pius XII in his 1947 encyclical Mediator Dei called ‘interior participation’ in the liturgical act of Christ in His members. On that note, pardon the pun, the only music recommended in the aforementioned constitution are Gregorian chant and its close cousin polyphony (especially Palestrina’s ars perfecta, which is really multi-layered, contrapuntal chant). The Church acknowledges Gregorian chant as specially suited to the Roman liturgy (ut liturgiae romanae proprium): therefore, other things being equal, it should be given pride of place (principem locum) in liturgical services. Chant is the most integral (everything necessary for ecclesiastical music is present); proportionate (all the parts of the music fit together purposefully); and clear (there is not obstacle to the full ‘truth’ of the music). Hence, it is the most ‘beautiful’ for liturgical use. Note the terms ‘sacred’ and ‘spirit’, which imply that the music must be set aside and fitting for the holiness of worship, like the vessels, vestments and the church itself, and not ‘secular’, reminding one of the world, and all that entails. The only instrument permitted by name at the Council is the pipe organ which is to be held in high esteem (magno in honore habeatur), for it is the traditional musical instrument which adds a wonderful splendor to the Church’s ceremonies and powerfully lifts up man’s mind to God and to higher things. In terms of other instruments, these “also may be admitted for use in divine worship, with the knowledge and consent of the competent territorial authority”. Yet this consent can be given “only on condition that the instruments are suitable, or can be made suitable, for sacred use, accord with the dignity of the temple, and truly contribute to the edification of the faithful”. Strong words which, if put into effect would make every Mass what it is truly meant to be. It would be difficult to argue that steel-string guitars, tambourines, pianos, to say nothing of drums of various sorts, can be made ‘suitable for sacred use’, and this secularity is only exacerbated by electronic amplification. As Pius X rightly saw, with the Vatican Council following, Chant and sacred polyphony display most perfectly the splendor and truth of liturgy, with due proportion of notes and harmony, with an emphasis on the sacred texts, an integrality that holds the liturgy together, and signifying in full clarity what liturgy truly is. Their neglect has been deleterious, and one of the principal causes of the loss of faith in what is signified: the reality of the Eucharist, heaven, hell, sin, redemption, judgement, and the serious and eternal implications of the moral life. A final brief excursus on why this music has, in the main, been ignored, left in the museum, presented only in concert halls, if not outright despised and scorned. 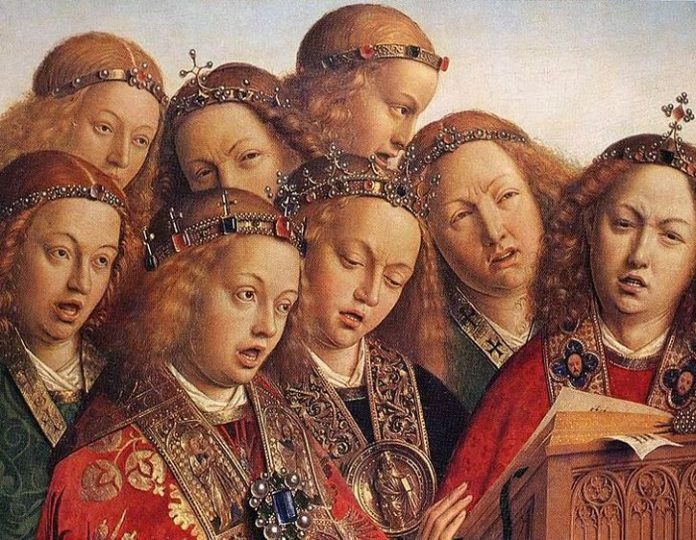 One would think that once heard, the treasure of properly sung Gregorian chant, Palestrina, Bach, Tallis, Victoria would render it impossible to return liturgically to four-chord guitars and treacly medleys. Yet it happens, all the time. Why? One reason is that singing chant and polyphony takes practise and discipline, not only to perform, but also to fully appreciate, and these are qualities not much in evidence in our world, within and outside the Church. It’s just all too easy to pull out the six-string and strum away. If the perfection of Christian prayer cannot be evaluated using the sublimity of gnostic knowledge as a basis, neither can it be judged by referring to the experience of the divine, as Messalianism proposed. These false fourth century charismatics identified the grace of the Holy Spirit with the psychological experience of his presence in the soul. As Saint Paul states (Romans 12:1), our worship is a logike latreia, often translated as ‘spiritual worship’, but the adjective is more literally ‘rational’. Liturgy should be an act first and foremost of the reason, yet all too many seek a working up of the emotions so that they ‘feel’ grace (which, as the Catechism (#2005) states, cannot neither be felt nor sensed). Is such emotionalism really grace, or just a cheaply bought imitation, all too often frittered away with the emotion itself? In opposing them, the Fathers insisted on the fact that the soul’s union with God in prayer is realized in a mysterious way, and in particular through the sacraments of the Church. Moreover, it can even be achieved through experiences of affliction or desolation. Contrary to the view of the Messalians, these are not necessarily a sign that the Spirit has abandoned a soul. Rather, as masters of spirituality have always clearly acknowledged, they may be an authentic participation in the state of abandonment experienced on the cross by Our Lord, who always remains the model and mediator of prayer. Prayer, not least liturgical prayer, requires that we enter into ourselves, so that we may be open interiorly to the grace of God, which works softly and quietly in our souls. Spiritual growth is a long and difficult process, following the path of the Cross, and there is no quick emotional fix. Secular music, especially of the raucous, loud and rhythm-driven variety, fitting in other contexts for those so inclined, is not only unfitting for the house of God, but will create an obstacle and a distraction to the self-reflection and meditation required for true spiritual growth. Only by returning to the truly transcendent music of the Church’s tradition will liturgy once again become beautiful as it is meant to be. Rather than bringing the clamour and noise of world into the church, we should rather be spiritually nourished and fed on heavenly music, as well as the heavenly food, so that we may be sent forth to bring Christ’s grace and truth out into the fallen and broken world, which stands in such dire need of salvation by something, or rather Someone, beyond itself. Previous articleIs Liberalism a Sin?